MIT IDE leaders are participating in the 2019 World Economic Forum in Davos, Switzerland, this week on a wide range of topics. Director Erik Brynjolfsson was featured on several panel discussions including one on Making Digital Globalization Inclusive on January 23, and another on January 24, discussing economic measures beyond GDP entitled, More Than GDP. 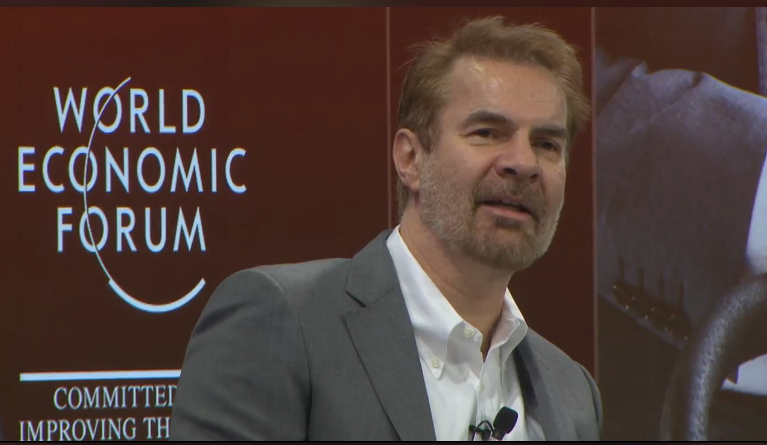 Erik Brynjolfsson discusses GDP trends at the WEF. Both forums addressed overarching inequalities—and misguided measurements-- that cause many sectors and countries to be overlooked in the digital economy. Brynjolfsson also spoke about Workforce Transformation and whether tech progress will leave people behind in a conversation with Karl von Rohr of Deutsche Bank AG. They also talked about the challenges faced by companies, NGOs, and government. IDE co-director, Andrew McAfee, spoke about human versus machine algorithm bias in a conversation with Justine Cassell, Associate Dean, Carnegie Mellon University. During their discussion of the Case for Inclusive AI, McAfee argued against over-reliance on human decision-making, while Cassell warned about the immature state of many machine learning algorithms today. Andre McAfee listens to Justine Cassell. Watch the videos here and here. IDE co-lead Alex Pentland addressed a forum on “Big data Meets the Markets: The future of data-dominated financial systems." He also spoke about “data for good,” and Blockchain and AI at an event co-sponsored by the MIT @medialab, the United Nations Capital Development Fund @UNCDF, and the Sustainable Digital Finance Alliance @SDFAlliance. Recaps can be found here and on MIT here. Sandy Pentland, at right, with co-panelists.